The main part of the house was built at the end of the 17th Century and the brick-faced service wing to the east was rebuilt during the 1740s. Like most sites in The Close it was originally leased to clergy but, in the mid-17th Century, the Mompesson family gradually accumulated a number of adjacent sites, including that of the Eagle Inn, in order to build a fine new house. Thomas Mompesson was MP for New Sarum. He died in 1701 leaving his son Charles, also an MP, to complete the house. There followed several wealthy owners who added to its fine interior decoration. There is a splendid staircase and much fine plaster work. Mompesson House was bought in 1952 by Denis Martineau, an architect, who donated it to the National Trust and lived on in the house for twenty years renovating it at his own expense. The National Trust refurnished the house and opened it to the public in the 1970s. It houses the magnificent Turnbull collection of some four hundred 18th Century English drinking glasses. There are also regular exhibitions including the work of Barbara Townsend 1843 – 1939 an accomplished watercolourist who lived in the house for over ninety years. 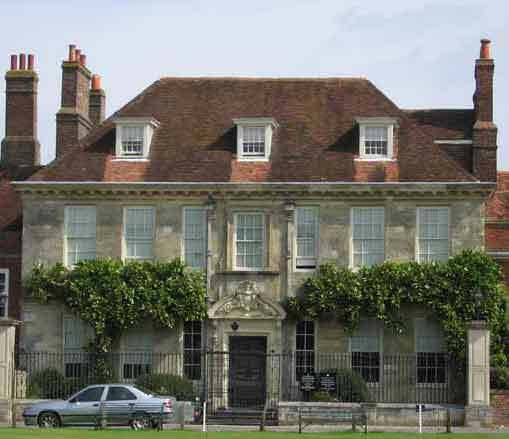 From 1946 – 1951 The Bishop of Salisbury lived in Mompesson House.